It’s been just over a week since we ran a smash-and-grab at Apple’s unveiling of its newest entries to the iPod family, the nano 4G and touch 2G. The devices, both set along an evolutionary (rather than revolutionary) path have certainly been nipped, tucked, and updated — but we wanted to know if they’d been improved at all. For the nano, we’ve seen some iteration of the same device for years now, leaving questions as to how much further you can take a low-end music player, while the touch is another story completely; a handheld which treads that ever-thinning line between entertainment device and micro-computer. Do either of these products hit their marks, or has Apple overextended itself in its pursuit of market saturation? Keep reading to find out. It was just about a year ago that we saw a real ramp-up of an increasing trend with Apple: a dead-on leaked photo of an unannounced product. 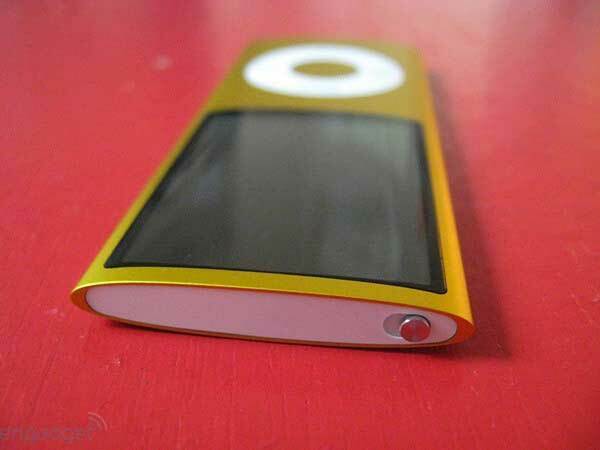 In August of 2007, we caught a glimpse of a short, fat, and let’s be honest… ugly little MP3 player that the rumoratti claimed was the redesigned iPod nano. What was probably more surprising than knowing that somehow Apple had let the leak slip past its all-seeing eye was the fact that the company had actually taken the design in this direction. 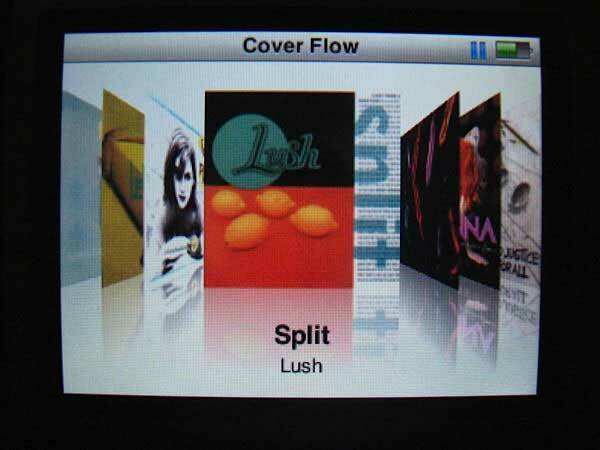 While one division appeared to be asleep at the wheel, another was cranking on high — around the same time, Apple released the first generation touch to the world, thus heralding a completely new direction in iPods for the company, and significantly impacting our perception of what a music / video player can and can’t (or should and shouldn’t) do. A lot has happened in the past year; Apple trotted out the MacBook Air, launched (with a few stumbles) the enormously successful trifecta of the App Store, iPhone 3G and MobileMe, the company lost (then found) its relationship with NBC, and battled rumors about Steve Jobs’ health (as well as his mistakenly reported death). In the midst of this flurry, can the company still pull off a relevant iPod, and does the touch have any more ground to gain? 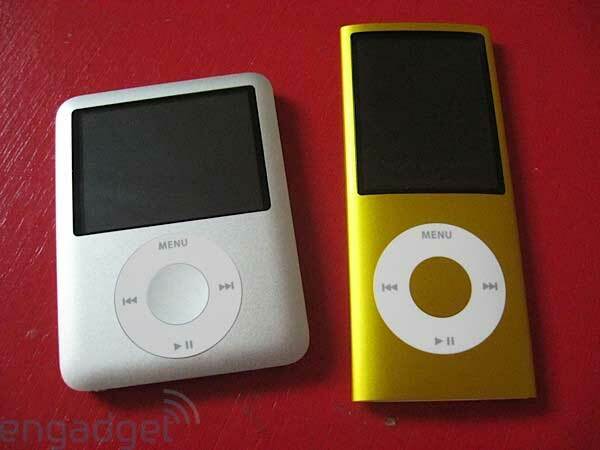 Let’s get this out there — the old nano was gross. Look, it wasn’t a bad little player, but there’s just something about that squashed, stout design that was a major turn-off. Try as we might to like it, we never got into that shape. It wasn’t just looks, either, the device was actually sort of uncomfortable to hold in your hands while getting to the jog-wheel. That’s all been rectified with the new version. Apple has essentially stretched out back towards the original nano form factor, long and lean — though they’ve kept that screen resolution (though flipped the screen) and tapered the edges to follow a MacBook Air-like smoothness. And did we mention the colors? Apple has smartly moved away from those drab pastels to nine bright hues, a literal rainbow that should appeal to just about any potential buyer. Beyond the colors, these feel lighter and leaner, have a relocated hold switch (up top) which is easier to get at, and the whole thing generally squeezes into a pocket (without getting lost) better than before. 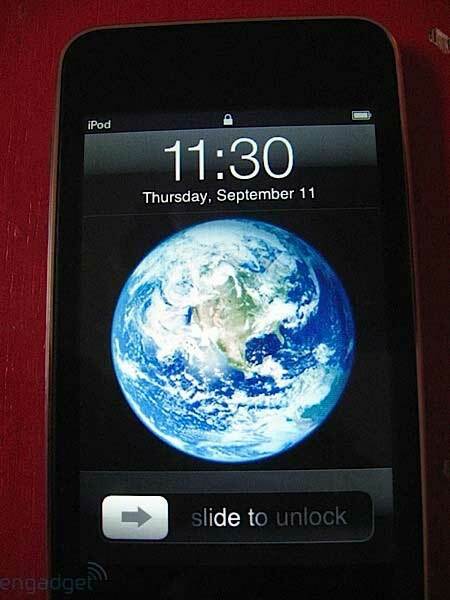 All in all, it’s just like your favorite iPod, but slightly thinner and slightly more handsome. This isn’t a quantum leap ahead, but it is certainly a welcome and reasonable step in the right direction. The touch would appear to have gone on a similar — if not exact — diet as the nano, but looks can be deceiving. 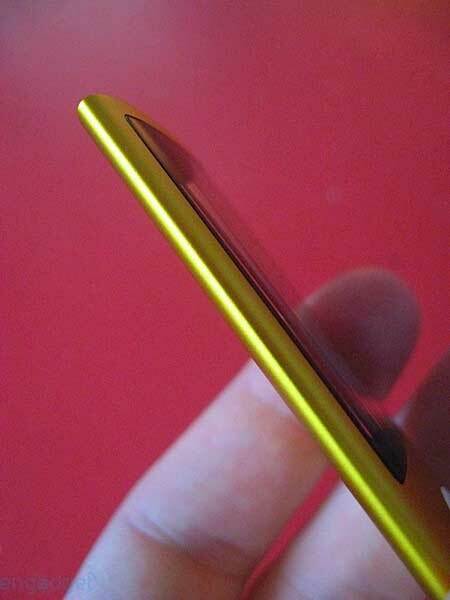 While the taper is more severe towards the top or bottom of the device, the thickness has actually increased a tiny bit (from 8mm to 8.5mm). You won’t notice it when it’s in your hand though, thanks to the more curved and palm-friendly design. The touch has certainly been worked over — the whole package feels tighter and less plasticky, and Apple has mercifully added an external volume rocker as well as a built-in speaker that can be heard, though definitely not seen. Everything feels pulled together more cohesively, and just like the new nano and iPhone 3G, it now complements the company’s curvy leanings. The silver backing (which we questioned the wisdom of in our first touch review) is still very much here, and very much getting smudged like you wouldn’t believe. 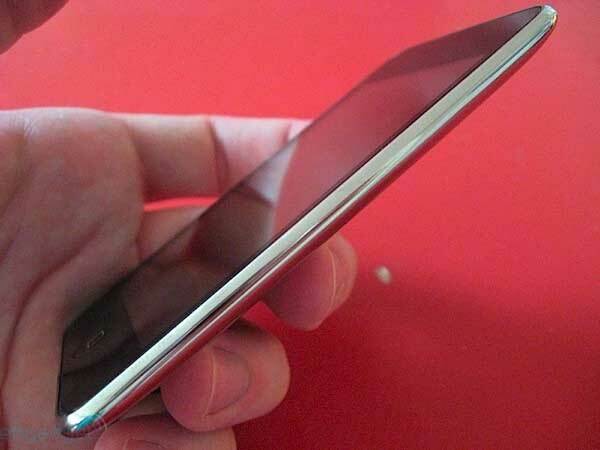 It looks nice from afar, but up close and personal it’s smear city — a side effect of this glossy back which makes the device look dirtier than it actually is. Still, it’s a small price to pay, and most people won’t mind at all. The screen on the touch seems to be on par with the recent iPhone 3G versions, though we did notice our model looked slightly, slightly more washed out than our iPhones — still, it’s incredibly clear, crisp, and easy to read. As with previous updates, the software is what’s seeing the most changes. In the nano, Apple has made a substantial shift in direction, moving away from the original interface into a strange no-man’s land between the iPhone / touch software and the more basic functions of its iPod line. Weirdly enough, it seems like just the right balance was struck by giving casual users increased functionality without pushing them too deeply into the PIM or PDA waters. Where the update really shines, though, is with the inclusion of Apple’s latest parlor trick, the iTunes Genius playlist function (we’ll expand on that in a moment), and the use of the player’s built in accelerometer (which allows you to shake the device to shuffle songs, and flips it into Cover Flow mode when it’s turned on its side). That shake function is more for show than anything (let’s be honest, it’s easier to click ‘next’), though using the accelerometer to get into Cover Flow kind of makes this feel like a skinny iPhone. Additionally, a new menu option activated by a long press of the center button and other thoughtful little features make it easier than ever to navigate your library and play music. But what about the touch you ask? Well you know that Steve made a big deal of the 2.1 update, and it doesn’t disappoint in the new model. The interface is faster, smoother, and generally more pleasurable to use. We’d been annoyed by kinks with the software through the last few updates (as you probably know), but the latest iteration seems to put to bed a number of issues we’d seen. Not a lot has changed in basic functionality from the last version, save for that Genius feature being added, as well as a few small tweaks here and there (like album and artist listed in song view). Let’s talk about that Genius feature. If you’ve used iTunes 8, you know all about it. The gist is that you can get thoughtfully arranged (though somewhat randomly selected) playlists put together without lifting a finger… er, well, by lifting one finger. Apple has gone to great lengths, they tell us, to build a system that not only bases its selections off of what music goes well together, but your listening habits and the listening habits of those with similar tastes. The feature is present on both the touch and nano, and works with some degree of success. 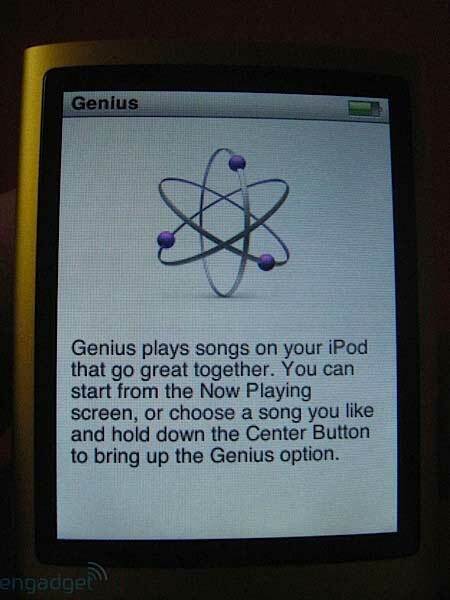 In order to get it started on the touch, we had to copy one of our Mac-created genius playlists to the device, but once it got there, Genius seemed to know what it was doing. On both the touch and nano we had decent results, though it by no means takes the place of a mixtape (or playlist in this day and age) created by an honest-to-goodness human. We’re sure they’re going to get there, though. 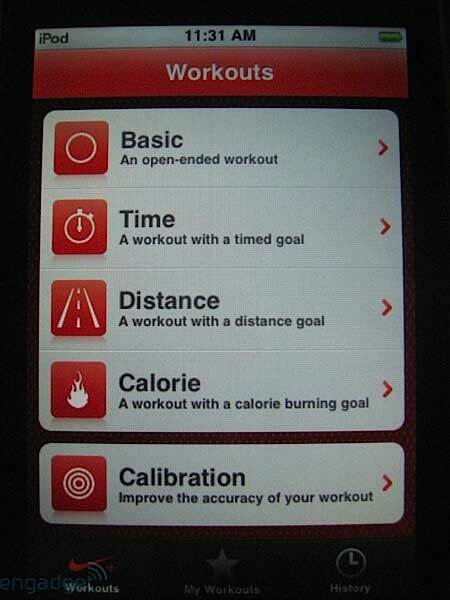 Apple’s inclusion of the Nike+ receiver and software on the touch will be a big… uh, plus to runners or walkers, though we think they could have taken it a bit further. 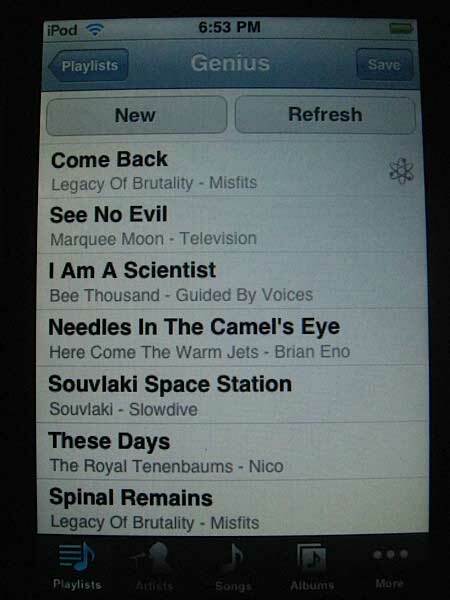 It certainly does a good job of basics — what you’ve come to expect on an iPod (with maybe a slight bit more flair), but frankly, we were hoping for more. It would be nice to see our runs, and heck, even upload them right from the device. C’mon guys, you put the software on a gadget with a WiFi connection that’s capable of high-performance graphics — why are you holding back? We’re hoping there’ll be some updates on this in the future; we know we’re just an App Store alert away from full functionality for this. That leads us nicely into our final thought on the touch and App Store combo. We know that the SDK opened a lot of doors for these devices, but Steve’s bold proclamation at the ‘Let’s Rock’ event that this is “best portable device for playing games” (as well as Phil Schiller’s demo) makes the company’s intentions somewhat clear. They’re gunning for at least part of the gaming market here, and the new lower price of entry for the touch ($229 for the 8GB) makes it a hard contender to ignore. The early games we’ve seen certainly hold their own, and we expect big things in the future — so this will be a space we’re watching closely. Additionally, with the ever-increasing selection of all sorts of software (even down to VoIP apps and fairly robust productivity titles), the touch is moving further away from an iPod and getting closer to a mini-computer. Why spend the money on a netbook when you can get almost all of the functionality (plus a lot more entertainment options) for about half the price? That’s a question we think a lot of people will be asking come December. The new iPod Nano 3G and iPod Touch supports MP4 and H.264 video, if your video is not compatible with iPod, you have to convert it at first, here is a nice iPod Converter that can help you rip copyright protected DVD movie and convert video to iPod. 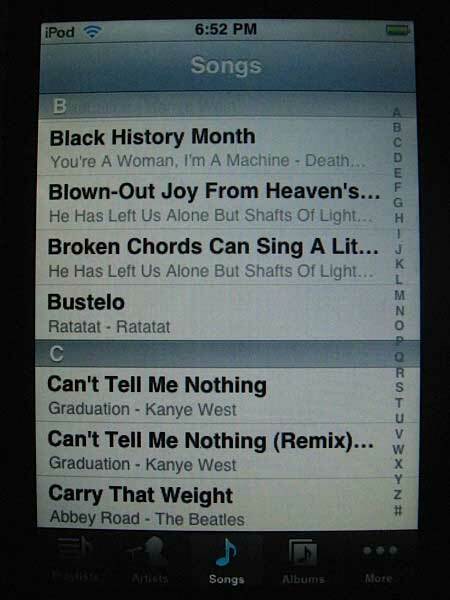 If you are Mac user, you can use this iPod Converter for Mac. If you want more DVD to iPod Converters, I think this DVD to iPod Review would help you a lot. Because iPod Nano has no internet function, if you want to download and convert YouTube video to iPod Nano, here is a step by step guide for you. It will also teach you how to burn YouTube video to play on standard DVD player. Sometimes, if you want to copy files from iPod Nano 3G and iPod Touch 2G back to computer, you can try thisiPod transfer, it can help you copy music, video, movie, photos, playlists, podcasts from iPod to PC. It supports all series iPod including Video iPod; iPod nano; iPod mini; iPod 4G; iPod nano 4; iPod classic; iPod touch; iPod shuffle; iPod shuffle 2; iPhone. We’re not going to tell you we put the nano or touch through a litany of tests to suss out battery life. Instead, what we did was use the devices like we normally would — we took them on road trips, walks, commuting on the train, and just about anywhere we went. We played music while going to sleep, when we woke up, and generally all day long. We watched videos on coffee breaks, late weekend mornings, and while getting our knees crushed on long plane rides. Here’s what we found: both devices have amazing battery life. After hours of music and video playback, we kept ending up surprised we hadn’t burned these further down. We don’t have hard data, but as reasonably aggressive users, we think the batteries go above and beyond their duty. You have to hand it to Apple — the players get smaller and sleeker, while the battery life keeps going up (well, unless you’re on an iPhone 3G). All in all, Apple has produced two perfect examples of why it runs things in this market right now. These aren’t massive jumps in usability, rather the culmination of lots of little threads coming together. If you’re in the market for a small player with decent features (especially if you’re shopping for friends and family), it’s easy to see the nano in the picture. Admittedly, the newest flash Zunes and a few other cheaper units may draw your attention away, but the market being what it is, you’ll have to want to get away from iPods to choose another model. The cost is reasonable ($149 for the 8GB, $199 for the 16GB), and the selection of colors and updated software will lure quite a few shoppers in this direction. The touch is another story altogether. With the lowered prices ($229 for the 8GB, $299 for the 16GB, $399 for the 32GB) and increased feature set, we can’t recommend it enough. For some, the capacity won’t answer your needs, and for those users the iPod classic or Zune 120GB models will be extremely attractive. For buyers in search of less storage and more functionality, however, there simply isn’t another product like this. The App Store has opened a flood of possibilities for the device, and the minor tweaks Apple has made to the unit bring it to right about where it should be. We’ll admit that even with the price cuts, the player isn’t the cheapest on the market — but that’s not what the touch is about.